I have been preparing for my role by spending time familiarizing myself with the production and my role by watching and listening to as many performances as possible. To help me contextualize the style in which the music was written, I have done research on the composer and the history of the piece. I am also working with my voice instructor who is helping me get ready to present my best work possible. I was drawn to the NUOVA program because it has such a good reputation for being one of the best developmental programs for young operatic performers. As I complete my undergraduate degree this year I am looking forward to my next steps, NUOVA will be a good step in helping to decide. Besides all the practical reasons, what could be more fun than to spend a month of my summer immersed in the whirlwind of putting on a full operatic production, surrounded by Canada’s best young performers and coaches? Mezzo-soprano Erika Rasmussen is a passionate young singer of opera and choral music. 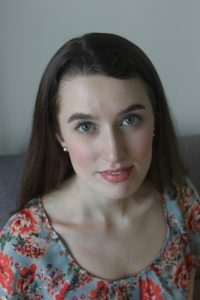 This year she is coursing her final year in Voice Performance at Brandon University, where she studies with Naomi Forman. Erika recently performed lead roles in Brandon University opera productions Vignettes of Passion (Muller) and Captain Lovelock (Duke). As well as performing in stage productions, Erika is an avid choral singer. Last June in Newfoundland, she completed her third year singing with the National Youth Choir of Canada, where she was featured as a soloist. Last summer Erika also competed in the National Music Festival which was held in New Brunswick.